Assignments - All done and good news? A group with 3 members(my group) got a higher rating in presentation on overall work compared to a group with 6 final year students. Wuahahaha!!! Managed to finish up on things and presentation for the other assignment went well. Mapsters competition - Those retards still haven't email anyone yet. I guess it's a hoax and they are not willing to part with that one little phone. Internship - 5 job offers(AMD, Intel, Swisslog, Guscapi, Accenture) and 2 companies(AMD, Swisslog) are aggressively trying to get me in. I wonder why the lecturers have to restrict me when I have proven myself over and over again that I could be there doing my internship happily. 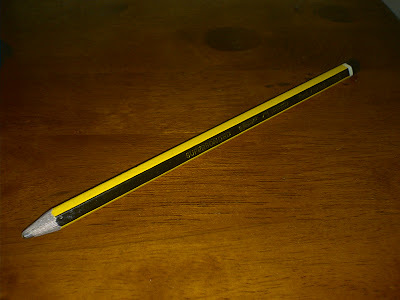 The pencil - I am still having it. Just too bad the kids can't have it back. Exams - Coming soon next week so expect less updates from me. Someone - I still miss someone so far apart now.